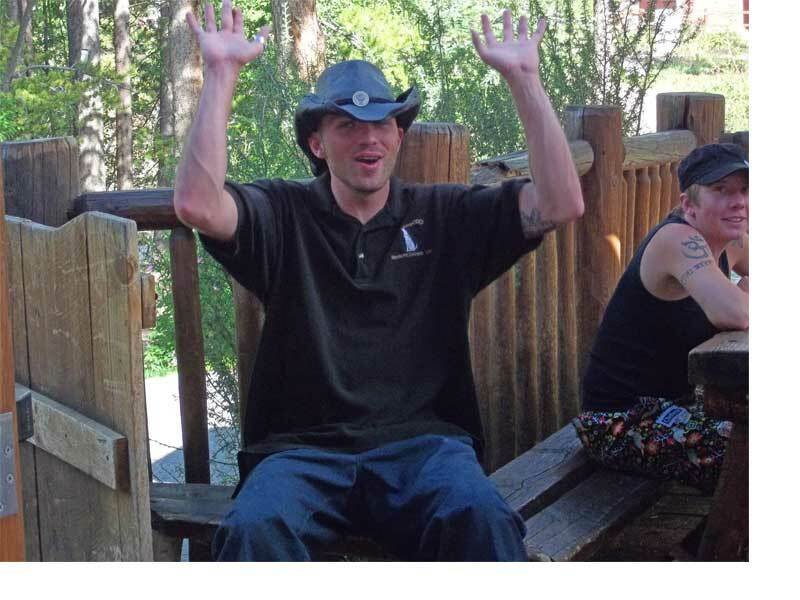 All Events & Catering recently catered a small, private function at inxpot in Keystone. 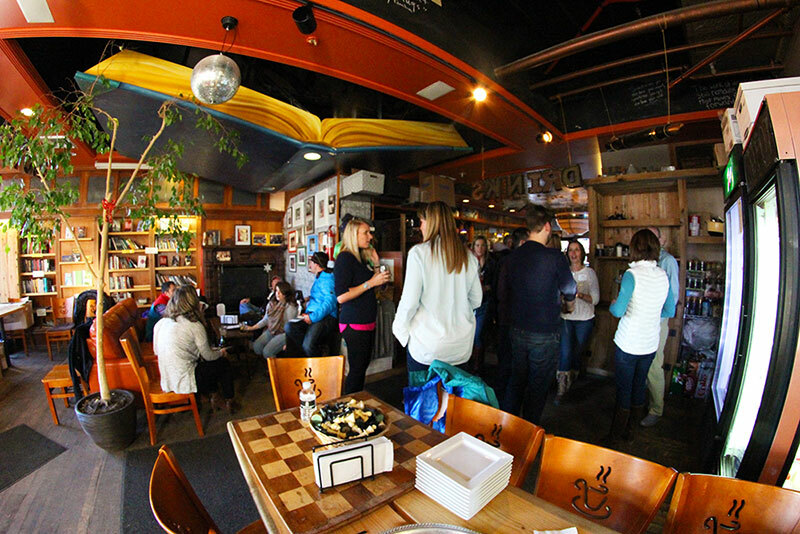 The coffee shop’s quaint, intimate location in River Run was perfect for the expected group of 80 people. In order to give exclusive members a warm welcome to the mountains, inxpot was reserved after normal business hours for select members from the Mountain Travel Symposium group. During the two-hour event, guests filtered in and out of inxpot. Thanks to the open layout, both casual mingling and intimate conversations flourished. While some individuals chose to linger around the bar area, others retreated to the comfortable seating options in the “living-room” area. There was also ample seating outside. The front and back patios at inxpot allowed guests to take in fresh mountain air while basking in the last moments of daylight. The variety of table sizes also came in handy; the small low tops acted as convenient drink holders whereas the long dining tables were great for member check-in and the catered food spread. 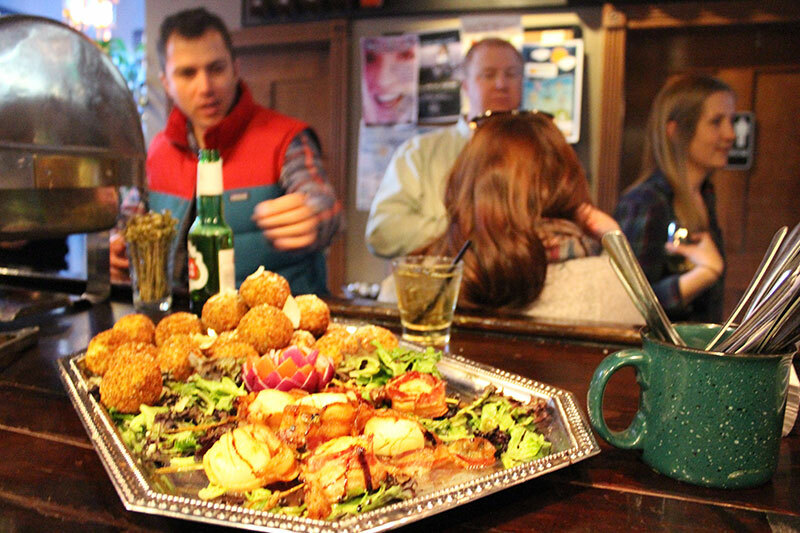 Speaking of food, the party had a great selection of both hot and cold appetizers prepared by Quandary Grille, one of All Events & Catering partner restaurants. Bacon wrapped scallops, smoked salmon canapés, and breaded pesto risotto were the favorite small bites featured at the event. The coffee shop’s bar-top acted as a convenient location for the catering hot plates and acted as a great meeting ground for guests. They could order drinks and graze the food selection, then return to their desired conversation area. Overall, the event was thoroughly enjoyed. The layout of inxpot was perfect for the estimated group size of 80 and fostered diverse conversation opportunities between guests. The coffee shop was a great venue not just because of its convenient location, but because it provided a one-of-a-kind mountain experience for the attendants. All Events & Catering was happy to organize the welcome party for the Mountain Travel Symposium group and hopes that they relish the event experience at inxpot for many years to come. Welcome to Breckenridge, Colorado. This quaint historic town has so much to offer. Established in 1859 during the gold rush and worth its weight in gold today for so many wonderful summer activities and its winter world class skiing. One of nature’s best for gorgeous mountain views and over 350 historic structures it’s a natural choice for creating just about any event you could imagine. The town of Breckenridge in known for its historic main street atmosphere nestled in the beautiful Rocky Mountains and plays host to many retail shops, restaurants, and night life. Breckenridge is a wonderful place to share with family and friends and has the ability to create some of your best memories. 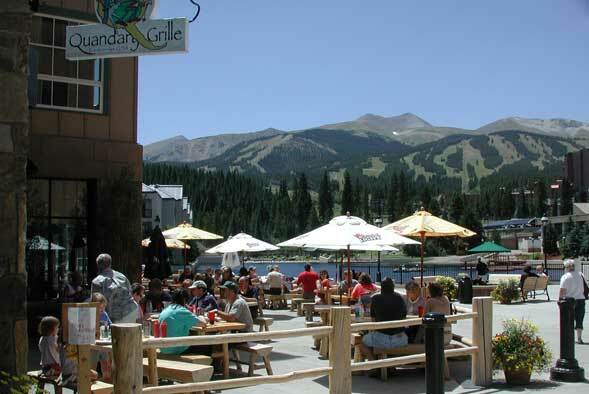 Summer in Breckenridge on the Quandary Grille Deck! We have you taken care of! 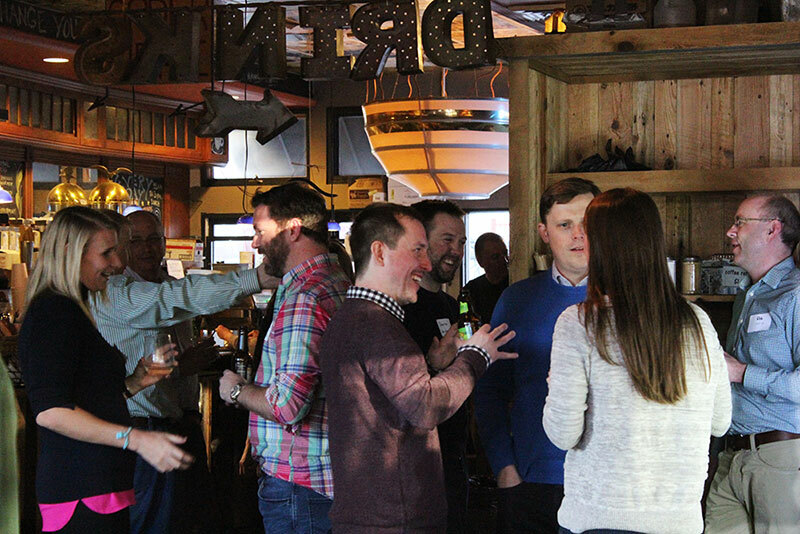 We host onsite parties up in one of our restaurants to 200 or we can arrange for an offsite event that will exceed your every need! Winter in Breckenridge is truly romantic. Everywhere you look, couples are holding hands and wandering the streets window shopping in this picturesque Victorian town. The snow covered street lamps and trees look like something out of a Norman Rockwell painting. The brisk mountain air invites you to warm up next to the one you love. 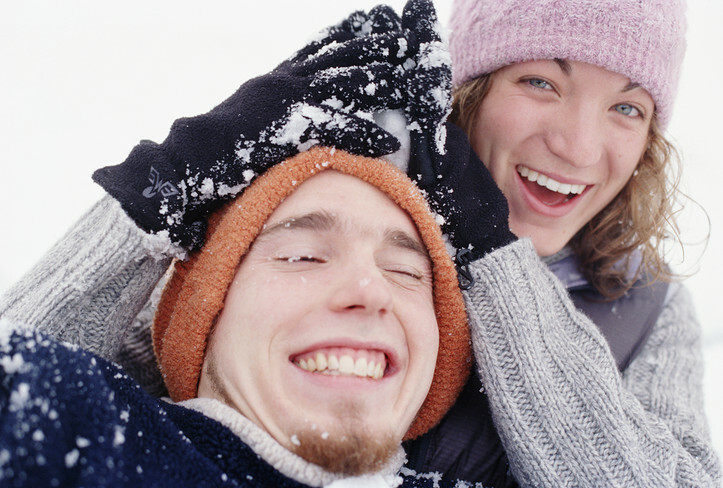 Those who like the outdoors will love the activities you can do with your sweetheart. A day of skiing on one of Breckenridge’s four peaks, with majestic views from the top, tons of powder and tree lined runs will ignite your passion for the sport as well as for each other. Parked along historic Main Street toward the center of town is an old horse drawn carriage ready for lovers to rent. The ½ tour will take you along the myriad of streets with your tour guide pointing out the historic landmarks in town. Bundle up underneath the blankets as you enjoy your ride. The carriage can also be rented privately for parties and weddings. After a day of activities, it may be time for some pampering. There are many spas in town who offer couples massages as well as many other services for you to spoil yourself or your significant other with. Indulge in Alpine Spa and Salon’s 75 minute Orient Essence Treatment. Blue Sage Spa offers the Decadent Chocolate Therapy treatment. You will be covered in a chocolate mask which will bring out the toxins in the body. Decadent for sure. Finally, nothing says romance more than a fabulous meal with your someone special – and Sauce on the Maggie Italian Eatery is the place to dine. Enjoy fine Italian wines, homemade Italian dishes from secret family recipes, scruptious desserts and after dinner drinks all in a warm and cozy atmosphere. Our pick is the beef carpaccio for your appetizer and the white clam linguini as your entrée – yum. Rehearsal Dinner Ho Down in Keystone, Colorado! When Nancy and Steve Hall first approached us to host the rehearsal dinner for their son, Adam’s upcoming nuptials, they certainly gave us a task! With so many beloved friends and relatives coming into town from great distances, they wanted to include everyone for the dinner, not just the bridal party – and – they wanted a ho down! Guests spent time after receiving their invitation scouring local western stores and consignment shops buying the perfect attire for the evening, cowboy boots, and blinged out belt buckles. 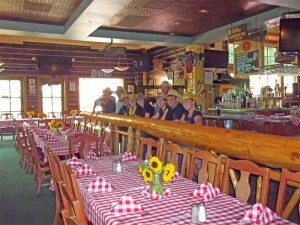 It was great fun planning the event, held at the Kickapoo Tavern in beautiful Keystone, Colorado. The Kickapoo already lends itself for a rustic feel, but our talented staff here at All Events and Catering didn’t stop there. 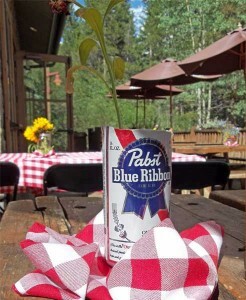 With checkered table cloths, giant sunflowers in mason jars tied with raffia and Pabst Blue Ribbon cans with fresh flowers in them the place really started looking festive. 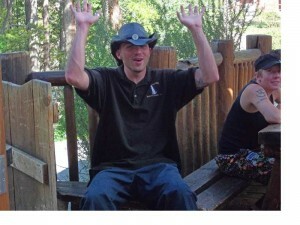 Then we gave cowboy hats to all of the servers and ripped apart a hay bale and spread it all over the floor! Mr. And Mrs. Hall went another step and hired a “caller” who wrangled the crowd later in the evening for a true square dance! The fabulous chef, Don, over at the Kickapoo had carved beef, rosemary chicken and loads of other “fixin’s” with a mountain elegant twist. Remember, our chef’s can prepare just about anything to your liking. 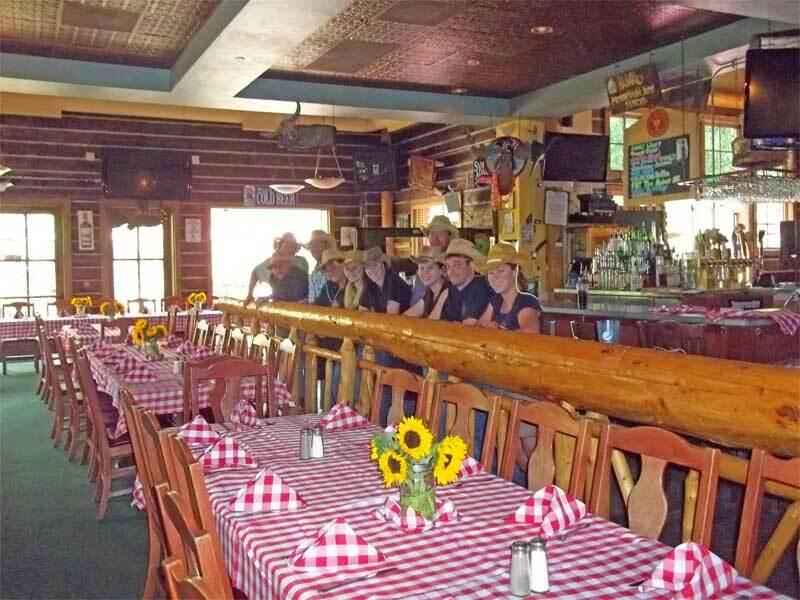 With 7 restaurants to choose from and numerous other outdoor and indoor beautiful locations throughout the mountains of Colorado that All Events and Catering can produce from – you can truly have a rehearsal dinner to remember!